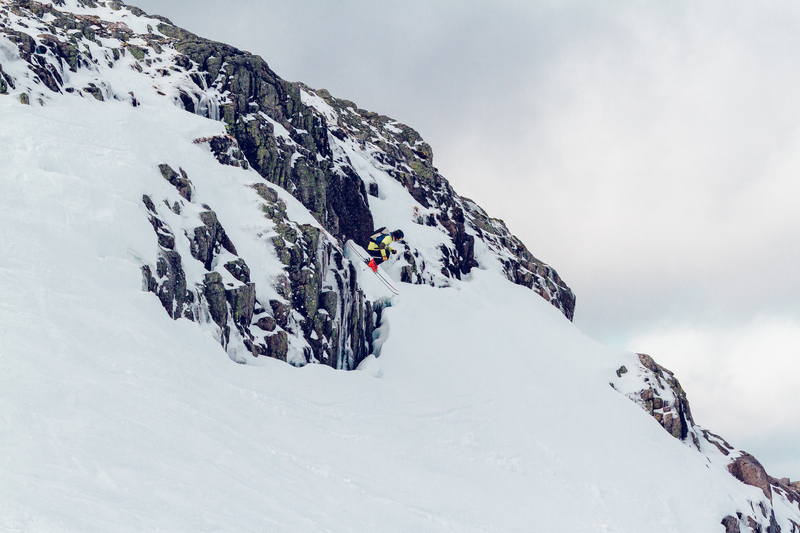 It was the weekend of the Coe Cup, part of the Scottish Freedom Series, a ski and snowboard free-ride competition which I like to capture on camera. The week prior, temperatures had risen and rain had fallen. Luckily there was a good amount of base on most of the upper mountain runs and Friday had seen lots of wind, but with some snowfall. An early start on Saturday with a quick drive up the A82 got me to the carpark by 8:30am. But as I chatted while getting ready, disaster! Where’s my jacket? Schoolboy error, I’d left it at home. The thought of driving for 4 hours round trip to go get it flitted briefly through my mind. But I saw sense and payed a visit to the hire department and got myself a replacement for the day. It was a warm padded one, so just kept my t-shirt on and ditched the fleece/down mid-layer. The hill had been stripped of the soft snow from last weekend but it was still white where it counted. Cliffy was off while the wind was still a bit gusty, but would start up as soon as it died down. I stuck to Main Basin as Mugs Alley and lower looked a bit patchy. I heard that Happy Valley was pretty had despite having been pisted so I didn’t bother with it or the Wall below. I’d carried my large camera bag up the mountain so had to dump it while I exercised my legs with several runs in pretty decent softer snow that filled the middle part of Main Basin. I would be photographing the Coe Cup competition which usually takes place on the Fly Paper, Glencoe’s infamous black run which hadn’t been open all season due to avalanche risk. However, I found out that the competition had been moved to the Spring Run instead. So I took a run down there to check it out and find my spot to set up the camera. The weather had been changeable, with the occasional gusty spell interrupting the any sun with spindrift and fast moving cloud. This visibility was generally OK, but some competitors did have clearer runs than others. Each competitor took one run for, and many without having had a chance to explore before hand. The field did well to cope with the firm conditions and maybe less features than they expected. You can see the complete result sheet for the Coe Cup here. I didn’t bother stopping for lunch as I had to leave a tad early at 3:00pm and get back to Glasgow, so after a quick run down from Spring Run through Mugs Alley and up the Wall T-bar I spent the rest of the day lapping the upper mountain. The following Sunday was forecast to bee windy and sure enough that held true. It did however bring some more snow with it which should help improve things across the upper mountain. I have Monday and Tuesday off work so hope to take advantage of fresh snow condition on the Monday! See you there. Forgot my bright green jacket! – A quick visit to ski hire.